Wednesday 5.15-6.15pm in Brighton, along or east of Ditchling Road. If you live in one of those areas and are free at those specific times then I should easily be able to fit you in, but I do have other availability so please get in touch either way. * Unfortunately I cannot tutor in Brighton on any other day. I am currently a teaching assistant in a secondary school having previously started but not completed teacher training in mathematics. 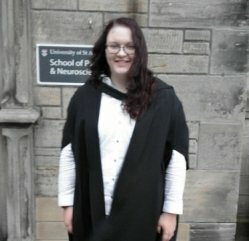 I have a first class undergraduate degree in maths and psychology, and a masters in psychology research with distinction. I grew up in Scotland and having moved down to Sussex for teacher training I have had to become familiar with all the differences between the Scottish and English maths curriculum. I have done this by both personal study and completing a Subject Knowledge Enhancement course through the university. Over 4 months last year I was training as a maths teacher working in schools 4 days a week. I taught classes to pupils between Y7 and Y10 and observed many Y11 classes. I was also part of a group of fellow trainees to teach an AS-level lesson at a sixth form as well as assist in GCSE resit and A2-level classes. Since leaving teacher training I have re-started my tutoring business. I have tutored a number of students for the new maths GCSE, both Year 11 students and Year 12 students doing resits, with the majority of students passing/ teaching their target grade. I have also tutored primary school pupils, as young as Year 2, who require extra tuition due to a variety of reasons including having students where English is their second language. In addition, I have tutored a few students with learning difficulties including dyslexia and autistic spectrum disorder. I also have recent experience with the A-level curriculum and I am confident that I can help any A-level student that may be struggling. I get to know the student to figure out how they work best, either helping them fully understand how a formula works or helping them follow a step by step process to find the solution, or something in between. I will work with the student to find out where their weaknesses are and then help them gain confidence in these areas. I will also work with the pupil to help ensure they are not making common mistakes and help them find new ways to understand and remember the processes and formulae required to do well in maths. Phoebe has been an excellent choice. She is very calm and teaches with a friendly approach. Our son throughly enjoys the lessons and looks forward to them every week. Phoebe has a great way with our son. He is enjoying his maths sessions with her and she is patient and explains the work so he understands. Phoebe is an absolute wonder! Total patience and expertise to get a super unconfident student through her GCSE.She goes the extra mile and I can't thank her enough.